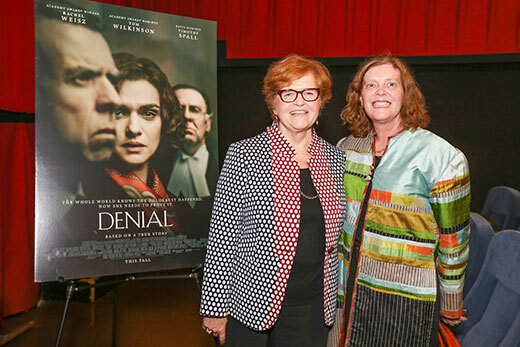 Professor Deborah Lipstadt poses with Emory President Claire E. Sterk after an Oct. 5 screening of "Denial," a new feature film based on Lipstadt's legal battle against a Holocaust denier. It’s always fun to wonder: If your life were made into a movie, what star would play you? Most of us will probably never know, but for Deborah Lipstadt, Emory’s Dorot Professor of Modern Jewish History and Holocaust Studies, that question is answered. Academy Award–winning actor Rachel Weisz fully and brilliantly embraces Lipstadt’s character in the new film "Denial," which captivated the crowd at an exclusive premiere screening hosted by the Emory College of Arts and Sciences on Oct. 5. The film is based on Lipstadt’s acclaimed 2005 book, "History on Trial: My Day in Court with a Holocaust Denier," chronicling her experience as the defendant in a British libel suit brought against her by David Irving, whom she had identified as a Holocaust denier in her 1993 book, “Denying the Holocaust: The Growing Assault on Truth and Memory." It also stars two-time Academy Award-nominee Tom Wilkinson as her British barrister and Timothy Spall as Irving. Written by David Hare, the script draws heavily on the transcripts of the London trial, during which the burden was on Lipstadt’s legal team to prove that she was correct in her assertion that Irving is a Holocaust denier. The story’s central themes include the value of facts and evidence in the pursuit of truth, the power in the Jewish tradition of care and respect for the dead, and the unexpected impact of remaining silent — even when it is difficult — to allow other voices and truths to emerge. Neither Lipstadt nor survivors of the Holocaust were called on to speak during the trial, which Lipstadt acknowledges was challenging, but she came to see the wisdom of the legal team’s strategy. In remarks following the screening, Emory President Claire E. Sterk praised Lipstadt’s determination, noting that the emphasis on evidence-based scholarship is among the University’s core academic values. “We all need to hold each other accountable,” she said. During a question-and-answer session following the screening, moderated by Emory Film and Media Studies Department Chair Matthew Bernstein, Lipstadt spoke about the relationship that developed between herself and Weisz during the filming. “I have come to realize that I was involved to an amazing extent,” she said, adding that she was on the set for more than half of the shooting. As Lipstadt’s character, Weisz wore the professor’s trademark scarves and a specially crafted replica of a ring that Lipstadt was given during a visit to Poland. More about Lipstadt’s work and the trial can be found on the Emory website Holocaust Denial on Trial.